Frank Baer, MHS-TM, DrPH was presented with the 2017 CCIH International Health Champion award at the CCIH conference. Frank was among the founding members of CCIH. One of his greatest contributions to CCIH was establishing CCIH’s Internet presence by securing the CCIH domain name and hosting its first website. Frank has served CCIH in various capacities – as Vice President of the Board, as Conference Program Chair and as editor of “The CCIH Forum.” Through those efforts he has continuously championed CCIH’s mission to connect Christians in promoting global health from a Christian perspective, especially in the area of health systems strengthening. He currently serves as Senior Advisor to IMA World Health and as Vice President of SANRU in the Democratic Republic of the Congo. Frank has been a constant supporter of CCIH and its mission to promote global health and wholeness from a Christian perspective. 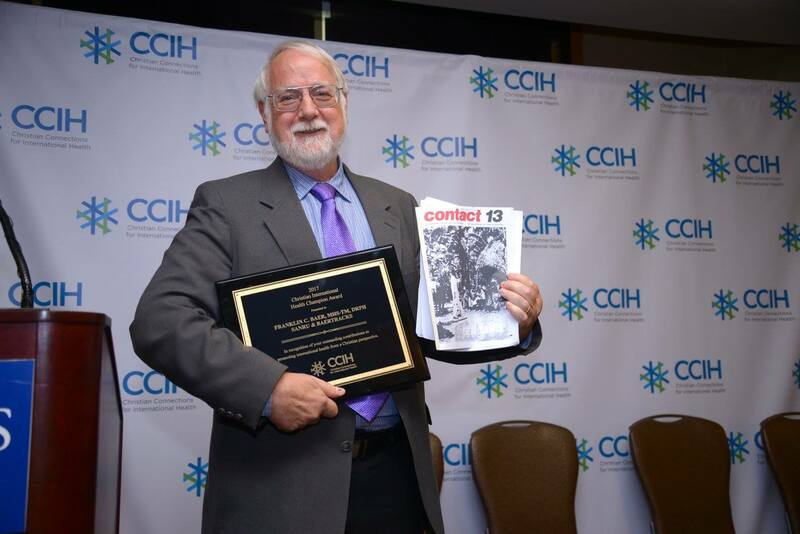 CCIH is grateful for his efforts through the years to help the network grow to what it has become today.